I’ve been pondering why the video has so much power. For those of you who may not have access to the video, I’ll briefly describe it. 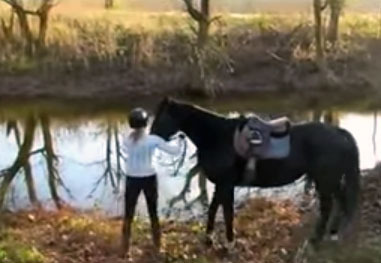 We see a pre-teen girl sitting on a horse, leading it toward the bank of a body of still water, likely a pond. The horse is clearly afraid and backs up. The girl leads the horse again – again the horse backs away. 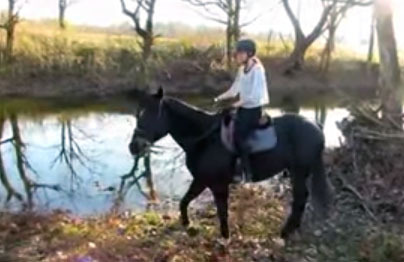 In the next scene we see the girl, now off the horse, leading the horse by the reins toward the water. The horse backs away again. But the girl is patient and persistent. She puts her foot in the water, and circles of water radiate from where her foot entered. She does this repeatedly and the horse looks at the rings of water and appears interested and puts its hoof in the water to o. Slowly, the horse appears to be more and more comfortable in the water. The girl leads it in further. The horse splashes the water with glee. The girl laughs and laughs and the horse, its comfort level quite high at this point, keeps splashing and splashing. The joy of the splashing is punctuated by the girl’s infectious laughter. Pure joy is expressed by the horse and by the girl. If we empathize with these two beings we experience deep fear, patience, curiosity, and joy all in a period of 2 minutes and 19 seconds! Horses are powerful creatures. The level of fear that I experience if I identify with this powerful creature is high. I am that horse and I feel the strong discomfort of discovering something new that scares me to the core of my being. Something guides me, though, to face up to this fear. I see someone else modeling comfort with water, and I realize that with this support and guidance, maybe I can try to face my fear. Not only is the fear overcome, but also the experience that follows is indescribably joyful. I find myself wondering about what I’m afraid of. What is standing in the way of my joy? My first thought is that I am afraid to express my feelings to family and friends. 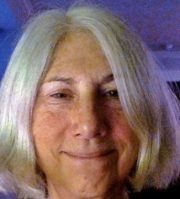 I grew up in a fairly non-expressive family, the reins held back because of fear of total loss of control and mental illness, a real and persistent problem in my mother’s family. As I write this, the tears come, so I think this is real. The water in the video perhaps symbolizes life and the free and full expression of emotion. This is what I have to learn to splash in and not back away from. Luckily, I have the good fortune of having a persistent guide, who, though I resist again and again, keeps grabbing my reins and pulling me toward the water. Perhaps this is why the viral horse video has so much appeal for me. How about you? What is your fear? What stands in the way of your joy?